If you’re having difficulty with forward bends, don’t assume it’s your hamstrings. Inflexible rotator muscles may be to blame. There is an old Sufi story about philosopher-fool Nasrudin, who was looking for his house keys under a street light. A couple of friends happened by and joined in the search. Finally, in exasperation, one of the friends asked Nasrudin where he thought he had lost the keys. Nasrudin pointed to a spot some distance away where it was extremely dark. But why are we looking here then? he was asked. He replied: Because it is so much easier to see under the light. This story reveals a common human tendency: to look where we want to instead of digging deeper to reveal the root of a problem. This is true of some yoga students who are trying to move deeper into their forward bends. You attend class regularly, sometimes for years, practice at home, and make progress in most poses—except for forward bending. You seem to have hamstrings of steel! No matter how often or how long you practice, there doesn’t seem to be any change. One day while teaching, I realized that I was like Nasrudin. I was looking in the wrong place to find a solution for some students who, no matter how often or how long they practiced, did not experience any change in forward bending poses. I realized that, like the hamstrings, a group of muscles in the hip area—the external rotators—can interfere with the ability to bend forward. Called the obturator externus and internus, gemellus superior and inferior, piriformis, and quadratus femoris, these muscles are short, broad, and very strong. While each of these muscles is a separate structure, they function as one, working to externally rotate the femur (thigh), stabilize the pelvis during walking, and help stabilize the pelvis and the femur together when you are standing on one leg. When you bend forward, all of the muscles on the back side of your body must lengthen, including the rotators. An especially important rotator is the piriformis, which attaches to the sacrum and to the femur; the sciatic nerve passes directly under this muscle. A tight piriformis can do more than just limit your forward bends. When a tight piriformis presses down on the sciatic nerve, it can lead to “piriformis syndrome,” which creates a radiating pain in the buttocks, down the back of the thigh, into the leg and foot. And if this rotator is especially tight, it can pull on the sacrum, affecting the functioning of the sacroiliac joint (the joint between the sacrum and the pelvis). When the sacroiliac joint is dysfunctional, the lumbar (lower) spine can also be adversely affected. So if your forward bends are limited, or if you’re experiencing “piriformis syndrome,” it’s a good idea to continue to work on your hamstrings, but also include a few rotator stretches in your regular asana routine. A note of caution: If the leg pain is great and/or persists, it is advisable to seek the treatment of a qualified health professional. Walking has a phase called the swing phase in which you are, in effect, standing on one leg: One leg is the support leg and the other is swinging forward but has not yet touched down. Because gravity tends to pull down on the pelvis, we need the action of the rotators on the standing leg side to hold the head of the femur and the pelvis together in a stable position. Rotators tend to get tight when this action is exaggerated, like when you run or dance. In order to understand this concept, try an experiment. Place your fingertips on the front of your pelvis, slightly to the side of the bony prominence called the ASIS (anterior superior iliac spine). Walk across the room and notice how these bony landmarks are held virtually level in relationship to the floor—this is because the rotators are holding the pelvis stable while you’re walking. Now, keeping the hands as they are, raise the right leg in front of you as if you are about to take a step. Allow the left hip to sway to the left. The pelvis is now tipped downward on the right as the right rotators are relaxed. Place the right foot on the floor and try this experiment on the other side. 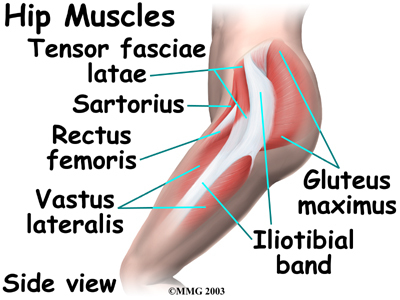 Dancers and runners usually have tight rotators because they demand increased stability from these muscles. Dancers, for example, need stable rotators when standing on one leg and lifting the other leg up in an arabesque. They might be quite flexible in other ways, but often have tight rotators. For runners, the increased momentum associated with the forward movement of the legs places greater demands on the rotators to hold the pelvis level. Try this: Stand up and place the feet a foot or so apart with the feet turned out as in second position in ballet. In order to turn the feet out when standing, you contract your external rotators to rotate the femur. If you hold them in this externally rotated position as if they are tight, you will see how that interferes with forward bending. Hold the buttocks firm by squeezing them together; try to bend forward. Even if you are supple, this will be difficult. If, on the other hand, you turn the thighs inward, stretching as opposed to contracting the rotators, this will facilitate forward bending. Now turn the toes and thighs inward as much as possible. Imagine that you are pressing outward with the heels but actually keep the feet still as you bend. It will be much easier to bend forward with the legs and feet in this position. This is because the external rotators are being stretched and thus are interfering less with the forward movement of the pelvis over the thigh bones. The five rotator stretches presented below are in order of increasing difficulty. The benefits they bring to other poses, such as Uttanasana (Standing Forward Bend), as well as to ease of walking, make them worth doing frequently. Because these poses can be deep stretches even for experienced students, attempt them when you are already warmed up by your regular yoga practice or some other physical activity. And remember: Recent research in muscle physiology has found that stretches need to be held for at least one minute in order to be effective. You may feel some of these stretches more on one side than the other. In fact, the longer you practice yoga, the more aware you will be of the differences between your right and left side. You may want to stretch the tighter side longer. After each stretch, walk around the room to relax the rotators. You may discover that walking is easier as the rotators loosen. Try practicing a forward bend to see how it has changed. You may also notice that your Padmasana (Lotus Pose) improves. Hopefully such observations will encourage you to make these poses part of your regular asana practice. Judith Lasater, Ph.D., P.T., author of Relax and Renew (Rodmell, 1995) and Living Your Yoga, (Rodmell, 2000) has taught yoga internationally since 1971. 1. Reclining Twist Lie on your back and bend the knees so that the feet rest on the floor. Inhale. As you exhale, bring the knees slowly to the chest one by one so that the lower back remains firmly on the floor. Squeeze your knees together and drop them to the left, keeping your shoulders on the floor. The legs should be approximately at a 90 degree angle to the body, but experiment to find the position that maximizes the stretch in your outer hips (especially the right one). As you stay in the pose, imagine that the belly is rotating in the opposite direction from the legs. Repeat on the other side. 2. Reclining Twist with Raised Knee Lie on your back with your knees bent and your feet on the floor. Cross your right ankle over your left knee. Inhale. As you exhale, drop the legs to the left, bringing your right foot to the floor and keeping your shoulders on the floor. To increase the stretch, gently push your right knee away from you with your left hand. This should intensify the stretch in the outer right hip. If you don’t feel this stretch, experiment with the placement of your right foot; you may need to bring it closer to the hip or move it farther toward the knee on the floor. Repeat on the left side. 3. Standing Pigeon Pose Place a blanket along the end of a stable, waist-high table. Lift your left lower leg onto the table with the knee bent; the shin and thigh should form a 90 degree angle. Keep the shin parallel with the far end of the table. Ideally, both your foot and knee should be resting on the table. If you find this too difficult, try a shorter table. You should feel the stretch in the outer hip and buttock of the left leg. If you are not feeling much of a stretch, bend forward as you exhale, making sure you don’t move your standing leg and knee. It is important that the forward bend comes from the hip joints. If you move from the hip joints, you should not feel a strong stretch in your back. If you bend from the spine, you will stress the lower back-and won’t stretch the rotators. You can further augment the stretch of this position by moving the supporting leg away from the table or moving the foot on the table away from your body. Repeat with the right leg on the table. 4. Modified Pigeon Pose Start in Downward-Facing Dog (Adho Mukha Svanasana). Step the right foot forward between the hands so that you are in a lunge position. Rest the left knee on the floor. Move your right foot so that it is exactly in the middle of your hands. Make sure that the right shin is perpendicular to the ground. As you exhale, let the right knee drop out to the right side. You will need to move your right arm out of the way. Place it where you need it for balance and then move your left leg and torso backward so that you actually open up the angle of the right knee; you will move your body slightly backward as you do this. It is important to keep the right foot slightly flexed so that you are putting weight on the outside rim of your foot and not your ankle. Some students will be able to bring the left thigh and right buttock all the way to the floor, as in the splits. Use bolsters or blankets for support if you can’t reach the floor. As you allow the body to drop down, keep the middle of the pubic bone exactly in line with the right heel. Most students, when they feel the deep stretch in the right rotators in this pose, will shift the pelvis to the right. It is better to keep the body a little higher and toward the left than to shift the pelvis off to the right side. After several breaths, repeat this pose on the left side. 5. Twisting Lunge Start in Downward-Facing Dog. Step the left foot forward between the hands so that you are in a lunge position. Rest the right knee on the floor. Make sure that the left shin is exactly vertical. Place the right forearm down on the floor and place the right palm over the instep of the left foot. Gradually let your body weight down onto your forearm. With your left upper arm on the outside of your left thigh and your left hand on your shin, hug your left leg toward your heart so that the chest drops down and you turn your breastbone toward the inside of the left leg. (Your hips will not be square in this position.) Keep the left shin vertical and the left foot flat on the floor. Repeat on the other side. < Previous The breath of a Yogi can save your life.